The out-of-this-world tripods they rest on render them more like tower speakers than bookshelf models. Buckminster Fuller is not a name that comes to mind when thinking of loudspeaker designs, but the inventive 20th-century architect and futurist, best known as champion of the geodesic dome, is surely having a moment in 2019 with the introduction of Q Acoustics’ new flagship loudspeaker, the Concept 300. 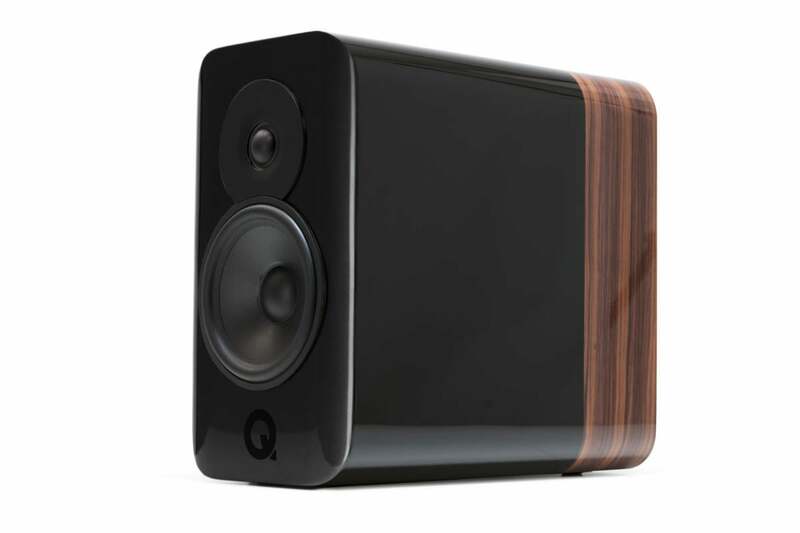 Update: We now have a complete hands-on review of the Q Acoustics Concept 300. Spoiler alert: They're fantastic. 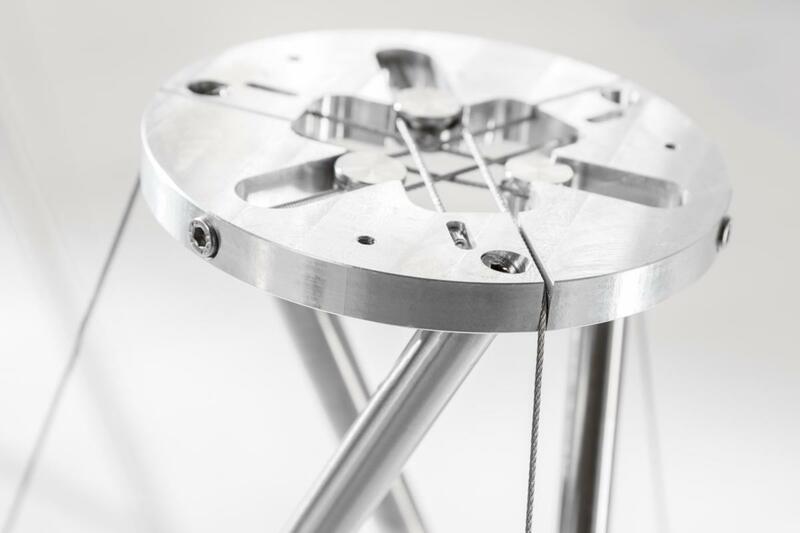 Bennett also said that “given that floors are often uneven, a tripod is intrinsically more stable than a four-legged stand.” In this case, the tripod’s legs are kept in place with pre-stressed, high tensile stainless-steel guy wires. 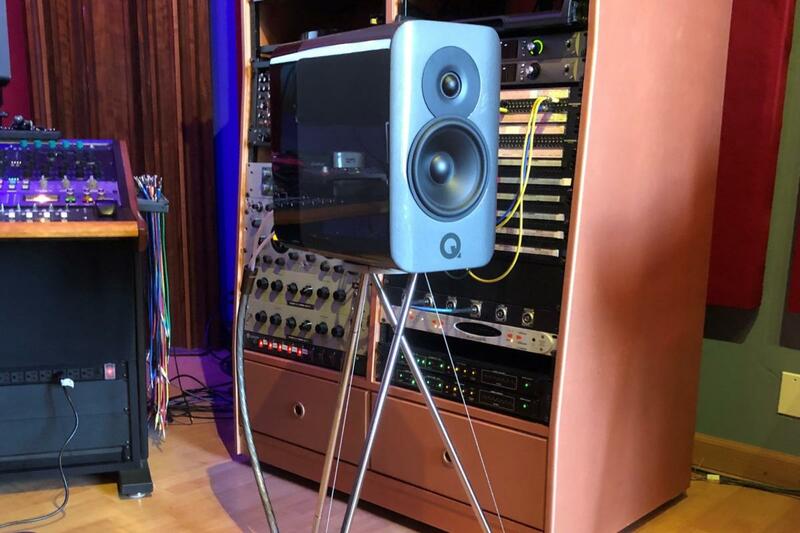 Q Acoustics’ Concept 300 speakers looked right at home in a Flex Studios room loaded to the gills with recording gear. Introduced to the audio press in one of the hushed recording/mixing rooms at Flux Studios in downtown New York City, the Concept 300 enclosures feature Q Acoustics’ proprietary Dual Gelcore construction that we delightfully encountered in the company’s entry-level 3020i bookshelf speakers. Gelcore adhesive holds the triple-ply MDF cabinets together, but the material never fully sets, according to the company. As such, it dissipates high-frequency vibrations, converting them to heat. At $4,500 for the pair (stands included and fully assembled), the Concept 300 certainly need to raise the bar compared to the 3020i. Q Acoustics says its engineers have taken many other steps to vanquish the buzz-backs that unnaturally color a speaker’s sound, shift musical dynamics, and blur imaging. Their multifaceted approach to controlling cabinet resonance has resulted in a 30dB improvement in signal-to-noise ratio across the board, according to the company, and sharply focused the music in space. “To the listener, our speakers are almost—our engineers like to call it—levitating,” said Bennett. 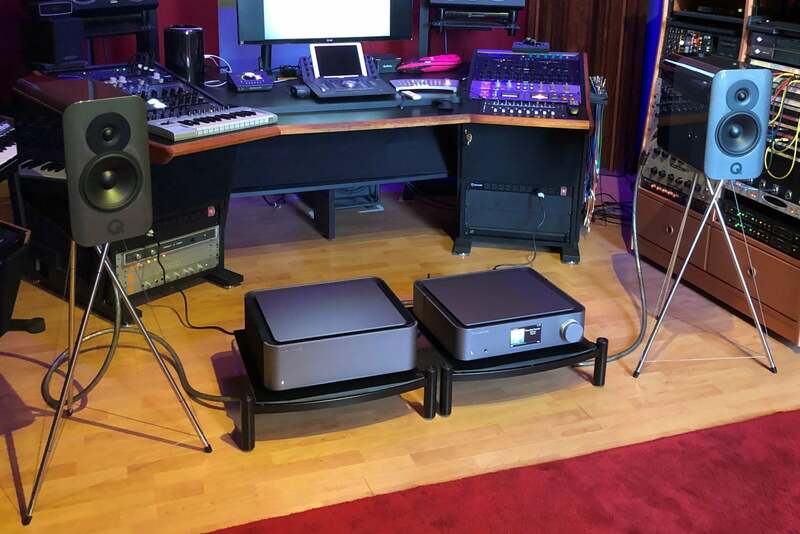 The stands that accompany Q Acoustics’ Concept 300 speakers are designed to isolate the speakers from the floor, and the speakers from the stands and the floor. Finite Element Analysis and laser interferometry inform the design of Q Acoustics’ Point-to-Point (P2P) cabinet bracing. Intended to do more with less, P2P bracing eliminates extraneous internal crosspieces that hold and tint the sound, reduce the speaker’s efficiency, and increase its weight. That doesn’t mean these puppies are bantamweights: Each speaker weighs a hefty 31.9 pounds, despite being remarkably slim when viewed face on: They’re just 8.6 inches wide and 14 inches high. Their mass becomes more apparent when viewed in profile or from the top down: They’re a full 15.75 inches from front to back, a design that offers lots of room for bass response from its 6.5-inch woofer. 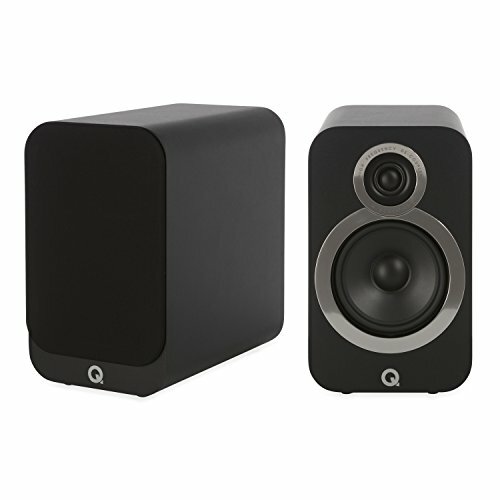 Equipped with a 1.1-inch dome tweeter, Q Acoustics reports a frequency response range of 41Hz to 30kHz (-6dB, with sensitivity of 84dB SPL, one watt at one meter). A two-tone look distinguishes the large cabinets in a contrasting wood finish. Three choices are available: Black with Rosewood (my favorite), Silver and Ebony, White and Oak. 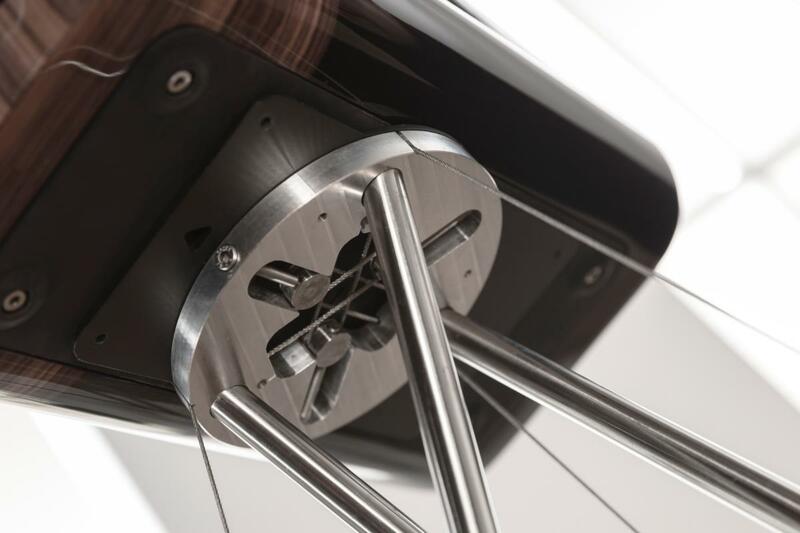 The stands are closely coupled to a suspension system inside the cabinets. The proof, of course, is in the pudding. I felt the East Village studio setting was almost too dry of a space. Still, the Concept 300s sure woke the joint with their high-clarity, in-your-face performances, with content fed from a Cambridge Audio Edge Series network streamer/pre-amp and matching amp (a $7,000 bundle). Especially natural, forward, and otherwise alive sounding were a made-in-the-hood club recording by Norah Jones (“Sunrise”) and the super-punctuated Nils Lofgren solo showpiece “Keith Don’t Go.” The Concept 300 made audiophile standbys Dire Straits (“Sultans of Swing”) and Steely Dan (“Dr. Wu”) seem fresh again. The Q Acoustics Concept 300 are outfitted with 6.5-inch woofers and 1.1-inch dome tweeters. Falling into the musical pool was likewise easy with a lush strings-scored (by his dad) Beck ditty “Paper Tiger,” and dreamy fusion instrumentals from GoGo Penguin and Kamasi Washington. Geez, even some heavy pumping EDM selections (and I normally have no patience for that stuff, outside a festival setting) kept this auditioner engaged. Needless to say, I’m looking forward to taking these speakers in for an in-depth evaluation in a more real-world home environment. This story, "Q Acoustics’ Concept 300, first impressions: These speakers make a bold statement" was originally published by TechHive.